It's that time of the year again, International Talk Like a Pirate Day or ITLAPD for short. Every September 19th the Buccaneer enthusiasts of the World rejoice as they once again can greet friends with a hearty "Ahoy, matey!" Originally started as a parodic holiday in Oregon, U.S., stems from the love of the Golden Age of Piracy. The holiday was created back in 1995 by Mark Summers & John Baur, and the story is as mad as it is unique. Summers claims that the holiday only came about due to a sports injury in a game of racquetball with Baur, when one of them reacted to the injury by shouting out "Aaaarrrrr!!" - And thus the idea was born! The game originally took place on the 6th of June, 1995, but out of respect for D-Day they chose Summers' ex-wife's birthday as it was easy to remember. Only in 2002 did the holiday go fully international when the pair of scallywags wrote to Dave Barry, he loved it and ran with it in his national newspaper column. 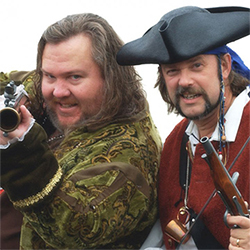 Summers and Baur now promote the holiday on their Talk Like A Pirate website, selling books and t-shirts for the occasion. Well you might be reading this and thinking how the hell do I speak Pirate?! Well thankfully this little website - Post Like A Pirate - has made it very simple for the rest of us. Working just like Google Translate, this simple little website quickly translate anything you want (has to be in English to work!) to pirate talk in a simple click of a button. You can also find out what your Pirate Name would have been to get further into the celebrations. There are even websites dedicated to only Pirate Jokes, a perfect way to impress your friends with some nautical knowledge! We hope this comprehensive guide to International Talk Like A Pirate Day helps you prepare and become the best damn Pirate this planet has ever seen! Oh and also don't forget, the 19th of September is also Butterscotch Pudding Day - Delicious! Last updated on 18/09/2014 by Jonathan Rolande.